This was the first release of milu deer into the wild in region in east China's Jiangxi Province where the species disappeared around 1,000 years ago. 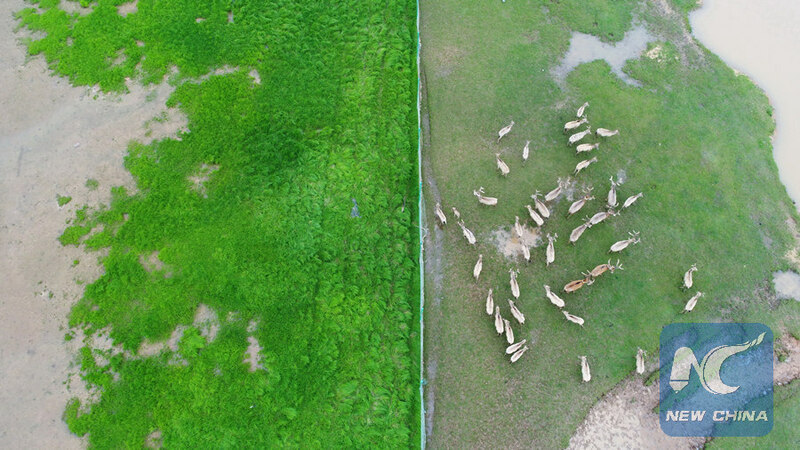 Milu deer are a flagship species of the wetland ecosystem and releasing them into the wild will help improve biodiversity and protect wetland environment, said Zhang Xiwu, deputy head of China Wildlife Conservation Association. The released deer weigh up to 200 kg and range from newborns to 10-year-olds. Each has ID microchips implanted and some have GPS collars to allow researchers to trace their migratory routes and habits. "We can offer timely help in case they have difficulty adapting to the environment," said Bai Jiade, director of Beijing Milu Ecological Research Center. 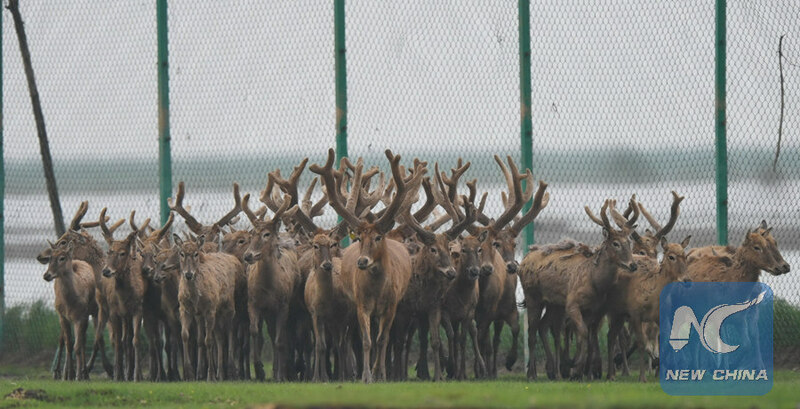 The center placed 10 milu deer in the Poyang Lake National Wetland Park in 2013 to conduct a five-year adaptability test to see if the deer could live and reproduce there. "Their numbers increased to 21 and this showed that the wetland was a suitable environment for the survival and reproduction of the species and has met the conditions for the release into the wild," said Bai. 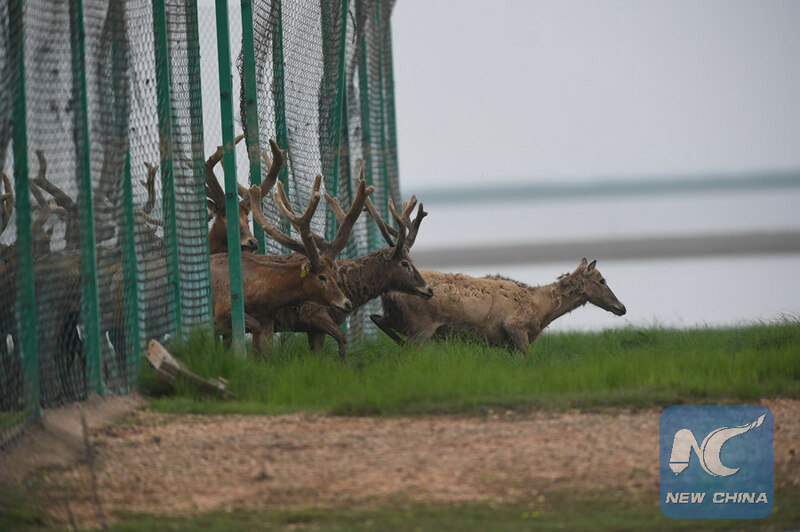 More milu deer will be released into the wild in the region each year for the next five to 10 years to help establish a wild self-sustaining population, said Yang Qibo, head of the Poyang County Wildlife Protection Station. Milu, also known as Pere David's deer, is a species endemic to China, but overhunting and habitat loss led to its near extinction in the early 20th century. The species, still under A-level state protection in China, was named after Armand David, a French missionary and naturalist who first recorded the existence of the deer in China in 1865. In 1986, the British government gifted 39 milu deer to Dafeng Milu National Nature Reserve in east China's Jiangsu Province, starting the revival of the population in its homeland. Milu was first mentioned in Chinese books more than 2,000 years ago. The wetland deer species bears the odd nickname of "sibuxiang," or "like none of the four" for its unique features -- a horse's face, a donkey's tail, cow-like hooves and a stag's antlers.